Need an eye catching pair of Gray dress shoes that are not only stylish but well made as well. You need to take a look at one of the leaders in mens fashion dress shoes, Giorgio Brutini. Giorgio Brutini knows how to combine real head turning Italian style made of leather for a very reasonable price for men who favor fashion. 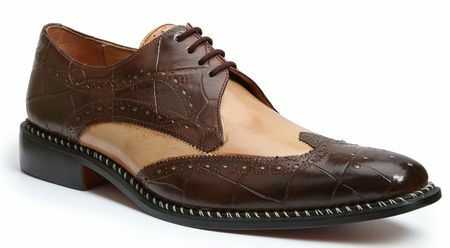 These brown and tan wingtip fashion dress shoes feature an Italian twist on the wingtip style with croc print leather and smooth tan leather making for a pair of mens fashion dress shoes ready to match up to your fashion suits.